A pet cat will bring love and joy into any home that accepts them with open arms and hearts, but that love gains a special meaning when the cat is a rescue from the streets. Many of these adopted cats have been saved from the brink of death. If you're considering getting a cat, we hope that this list will convince you to to adopt. They need your love! If you have a cat whose life was saved by you or your vet, then please share their story with us! :( ohh noooo…. poor kitty… she looks sooo much better!!! She is very lucky! The real question is...how the crap did he get in a gutter in the first place? 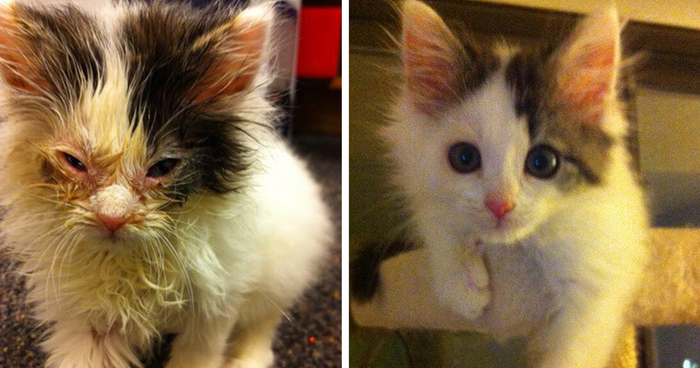 I cant believe this is the same cat!Even the eyes show no trace of past neglect and illness!Great job and God bless! having our two rescued cats I love this post! Our own kitties used to be starving and very scared and now are friendly and happy!! Aww what a fitting name! There are rare exceptions to the rule. There are male calico cats, look it up. #16 ️diamond - A True Diamond In The Rough. He Is Now One Happy Kitty! Shows what love can do. Xo Diamond. Poor thing... so glad it found a loving home!! Whatever happened to this kitty was pretty bad judging by the before picture. #21 She Beged Me For Food, And I Bring Her Home Forever. He looks happy and healthy and very inquisitive! Who dared to poison such a cute kitty!? I feel really sorry for her former owner. #36 Arwen - The Day We Saved Her, Abandoned In A Basement, And 1 Year Later - Stunningly Beautiful! he has a cute beard.^-^. #41 Gülümser (means "the One Who Always Smiles") Was From A Garbage Container On Istanbul. #45 Naiver Was Found Abused On The Street. He's Now A Young Healthy Man Ever. Looks like a real life Garfield! #50 Our Buddy Found Us Almost Dead 3 Years Ago. Now We Can't Imagine A Single Day Without Him. #54 Bella, Before And After. At Two Month (?) And Now - At Ten. Extremely Happy! #55 My Cat Ilja Was Abandoned And Rescued. He's One Year Old Now And Very Happy In His Forever Home. His before picture is pretty rough. #63 Nerito After A Year! #66 #81 Sweetie Was Abandoned For Being "too Vocal". I Just Say She's A Great Communicator! #67 Sunshine Was Abandoned And Found With Infected Eyes, Matted And Flea Infested Fur. Sweet Gabby is just one of the many kitties that I have rescued from dangerous situations and found wonderful homes for! #70 Tara, Found With A Badly Broken Pelvis, Draggind Her Leg. 3 Months Later She Walks On 4 Legs. He is purrfect! Thank you for giving him the love he deserves! #72 Mari - Hit By A Car, But Made A Full Recovery! #75 Sick Kitten From The Animal Shelter Before, Sweet Home Tyrant After. #77 Kitten After A Car Pass Over Him! And Then, He Is Here, After A Lot Of Love. #79 Meatball, Found In Car Engine, Almost Lost Two Eyes. 6-month Later, She's A 1eyed Princess. She should wear an eyebadge and become a pirate princess! #80 Squirt, Feb 2013, Thin And Neglected By His Owner. July 2014, Healthy, Well Fed, And Loved.